The World has been facing an acute problem of mycotoxins in recent years, though its history goes back for more than one hundred years . Cases of mold toxins poisoning in humans and animals were known as far as in the Middle Ages. FAO estimates show that up to a quarter of the world's foods contain mycotoxins . One billion tons of agricultural products are under the potential risk of mycotoxin contamination . In Russia, the amount of grain contaminated by mycotoxins has increased tenfold in recent years. Up to 45.0-74.7% of grain samples in the Central, Central Chernozjom, Volga-Vjatka and Volga regions of Russia are contaminated by fungi of the genus Fusarium . The analyses of feed, vegetation, various agricultural products, food products show high (up to 80-100%) contamination by microscopic fungi, specifically by toxigenic fungi in 40-60% of cases, and in 21% of cases production of mycotoxins in hazardous concentrations was detected. More than 30% of feed and other agricultural products are contaminated by mycotoxins . Livestock sector suffers serious economic losses from reducing productivity and reproduction of farm animals due to disorders caused by mycotoxins . A significant contamination of grain by microscopic fungi of the genera Fusarium and Alternaria in most regions of Russia shapes the urgency of the mycotoxin issues for the grain-producing regions of the country, and stresses the need to control the quality of raw grain . To date, there are more than 250 species of fungi that produce several hundred mycotoxins, of which trichothecenes, aflatoxins, patulin, ochratoxins, and zearalenone are the most common and dangerous to the health of humans and animals. The representatives of the trichothecene group include toxins such as T-2, diacetoxyskirpenol, HT-2, deoxynivalenol, nivalenol, roridine A, krotocin. They are produced by both obligately saprophytic fungi (Stachybotrys alternans) as well as plant pathogenic fungi (Trichoderma roseum, Myrothecium verrucaria, Fusarium spp.). Major producers of T-2 toxin were isolated from feed and food raw materials which caused foodborne toxicoses in agricultural animals and humans. These include Fusarium poae, F. acumination, F. sporotrichioides. Deoxynivalenol (DON, vomitoxin) is mainly produced by various strains of F. graminearum, F. culmorum, F. nivale. It should be emphasized that one and the same kind of producer fungus can synthesize several mycotoxins. Trichothecenes exhibit teratogenic, cytotoxic, immunodepressive, dermatotoxic properties, affect hematopoietic organs, central nervous system, cause leukopenia, hemorrhagic syndrome, trigger a number of food mycotoxicoses in humans and animals. The toxic properties are due to their involvement in the suppression of protein biosynthesis . Among the mycotoxins produced by Fusarium fungi, special consideration is given to deoxynivalenol (DON), zearalenone and fumonisin in the European Union . Ochratoxin A, B and C are produced by Aspergillus ochraceus and Penicillium viridicatum fungi. Ochratoxin A is the most toxic agent while it is most often present in foods. Mycotoxins of this group have nephrotoxic, teratogenic and immunosuppressive effects. They inhibit protein synthesis and interrupt glycogen metabolism. Ochratoxins trigger renal disease in pigs [14, 16]. Pigs are very sensitive to mycotoxins produced by fusaria. Diseases usually appear in Winter and Spring and in most cases have an implicit zonal dependence. In case of an acute form of the disease, animals die within 15-20 hours after eating their food containing the toxin . Toxic effects of T-2 toxin appear differently in poultry, depending on the duration of its presence and concentration in the feed. For example, in case of layers, if T-2 toxin is present in the feed for 14-18 consecutive days, there is a decrease in egg production and egg weight. In addition to the mentioned symptoms, prolonged use of the mycotoxin-containing feed results in eggshell thinning, reduced hatchability, craw mucosa and gizzard stomach lesions. Importantly, a simultaneous presence of mycotoxins such as aflatoxin and T-2 toxin in the feed has the greatest immunosuppressive effect – a synergy is observed . Mycotoxin content in food and feed varies widely and can reach hundreds of micrograms / kg, that’s why their levels are subject to regulations in many countries. Hygienic requirements for the quality and safety of food raw materials and food products accepted in Russia (SanPin 2.3.2.1078-01) limit the level of T-2 toxin in grain to 0.1 mg/kg and provide for its absence in baby cereal-based food (< 0.005 mg/kg). Wheat grain may be used for food purposes if it contains deoxynivalenol (DON) of not more than 0.7 mg/kg. The maximum allowable concentration of zearalenone in grain, grain products, nuts, seeds, oil seeds, fats, oils, protein isolates is 1 mg/kg and it should be absent in baby food and dietary food. The content of ochratoxin A in bread grain, including wheat, rye, oats, barley, rice and grits, flakes, wheat flour, pasta should not exceed 0.005 mg/kg . The protection of crops against mycotoxin contamination using conventional direct-action fungicides is not always productive, as the toxins are produced not only by phytopathogenic but also by saprophytic, endophytic, mold fungi. Moreover, our studies have shown that the application of chemical fungicides may even lead to increased levels of ochratoxin in yield of barley and HT-2 toxin in wheat (Table 1). Perhaps, this is due to the suppression of non-toxigenic microbes. The application of immunizing fungicides (including biostimulant Albit) seems to be promising in this respect. Immunizing effect of the biostimulant allows it to control the development of those plant pathogenic fungi which do not manifest themselves through symptoms of disease. In particular, this applies to toxicogenic fungi developing in ear of cereals. 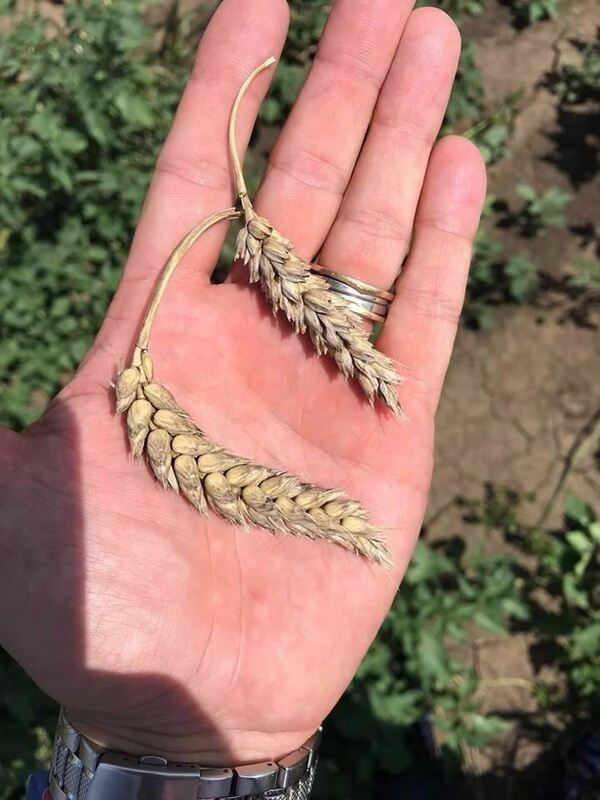 According to the previous studies, Albit has biological efficacy against Fusarium head blight in the range of 35-45%, against Alternaria blight up to 50%. Besides that, unlike many chemical fungicides, Albit does not have general biotoxic effect . For example, on photo (field trial of Agricultural Experimental Station SCDA Lovrin) you can see protective effect of Albit (Fig. 1). The purpose of our work was to evaluate the effect of Albit treatment on mycotoxin content in grain harvest. Mycotoxins in grain samples were identified by using conventional HPLC-based techniques [7, 6] in the state-certified laboratory TEST-Pushchino, Pushchino, Moscow oblast’. Samples were taken from field trials conducted in different regions of Russia. Primary research results are shown in the Table 1. The application of Albit in recommended dosages has been found to reduce the content of ochratoxin and trichothecenes on the background of both pure check and chemical pesticides, in case of grain contamination above threshold levels. The further more detailed studies were conducted in oats. Oats is consumed by animals and humans (instant cereals) in a practically unprocessed form, so mycotoxin content in this crop is crucial compared to other grains. Furthermore, our previous experience has shown that the concentration of toxins in the oats grain was higher than in other cereals (Table 1). Detailed experiment on different Albit dose applications to the Lion oat was conducted in 2012 in the experimental field of the National Plant Protection Institute of the Russian Academy of Agricultural Sciences in the Voronezh oblast’. Albit was used by the scheme proven for most cereals: pre-sowing seed treatment and further spraying with herbicide in the tillering stage. Pure herbicide treatment (a.i. tribenuron-methyl) served as a check. The Albit dosage is ranged from 10 to 100 ml / ton (ha). The most dangerous trichothecene mycotoxins T-2, HT-2, DON and ochratoxin A were selected for evaluation. All the studied Albit dosages led to an increase in the yield of oats (by 8-12% at the check level of 3.55 t/ha). The development of diseases peculiar to oats in this area (leaf red-brown spot and Septoria leaf spot) was observed to a very small extent (incidence 1-2%). However, mycotoxin contamination of grain was sufficiently large (about 1 mg/kg). The analysis of the grain harvest has shown that Albit application has helped to reduce the content of almost all the studied mycotoxins in it. Mycotoxin level reduction compared with the check without Albit treatment ranged from 25% to 71% (Table 2). However, when using certain Albit dosages, the levels of mycotoxins in grain conversely exceeded the check levels. absolute mycotoxin content levels (mg/kg of grain) are given for the check variants. The lowest rates of Albit application has demonstrated the maximum efficiency against trichothecene mycotoxins and a sharp jump in the level of ochratoxin A. Alternatively, higher dosages of the biostimulant have shown increased efficiency against ochratoxin and several maximum levels of trichothecenes deoxynivalenol. Thus, lower dosages of Albit are more effective against those toxins produced by Fusarium spp. and are inactive against toxins produced by fungi of the genera Aspergillus and Penicillium. At the same time, Albit at high application rates, is less active against fusariotoxins and is more active against ochratoxin A. According to data aggregate, the Albit effect was the highest at the 20 ml / ton (ha) application rate since its use was not marked by an excess of any of the mycotoxins studied (see Table 2). In assessing the Albit effect on the total content of mycotoxins in grain, the averaged picture shows the maximum of Albit anti-mycotoxin activity at low application rates and the minimum at 60 ml/ton (ha) dose (see Figure 2). The data obtained are consistent with the 2011 oats experiment (Table 1) and allow us to recommend the application of Albit in the dosage of 20 ml / ton of seeds + 20 ml/ha to reduce mycotoxin content in oats harvest. Mycotoxin content was reduced under Albit application by approximately 25% in the 2011 experiment with an overall higher mycotoxin content, and by 40-60% in the 2012 experiment with a lower level. The application of other dosages of Albit may, in contrast, increase contamination of grain by some mycotoxins. Thus, the results of the studies conducted have shown a significant effects of Albit against mycotoxins in grain harvest. 20 ml/ton (ha) Albit application makes sense for oats and standard recommended drug doses of 30-40 ml / ton (ha) are reasonable for spiked cereals (wheat, barley). Afonjushkin V.N., Leonov S.V., Gorodov V.S., Morozov K.V., EV, Dudareva E.V. Mycotoxicoses: their role, diagnostics and fight against them// Archives of Veterinary Science, 2005. - V. 6. – No. 53. – pp. 27-34. Antipov V.A., Vasiliev V.F., Kutischeva T.G. Mycotoxicoses are an important issue of livestock husbandry // Veterinary Medicine. 2007. – V. 11. - pp. 7-9. Commission Regulation (EC) No 1881/2006 of 19 December, 2006 setting maximum levels for certain contaminants in foodstuffs. Official Journal of European Union, L364, pp. 5–24. Fetisov L.N., Soldatenko N.A., Rusanov V.A. Mycotoxins in animal feed is one of the issues of modern livestock husbandry in the Southern Federal District / / Progress of Medical Mycology: Materials of the 4th All-Russian Congress of Medical Mycology. - V. 7- Moscow: National Academy of Mycology, 2006. – 346 p.
Gagkaeva T.Yu, Gannibal F.B, Gavrilova O.P. Contamination of wheat by Fusarium and Altemaria fungi in southern Russia in 2010 // Plant Protection and Quarantine, 2012. – V. 1. - pp. 37-41. GOST 28001-88. Fodder grain, products of its processing, mixed feeds. Methods for determination of mycotoxins, T-2 toxin, zearalenone (F-2) and ochratoxin A.
GOST R 51116-97. Compound feeds, grain and grain by-products. Method for the determination of deoxinivalenol (vomitoxin). Hamidullin T. Mycotoxin infestation of feed // Animal Nutrition and Forage Production. 2006. – V. 3 - pp. 15-17. Huff W.E., Kubena L.F., Harvey R.B., Doerr J.A. Mycotoxin interactions in poultry and swine // J. Anim. Sci. – 1988. – V. 66(9). – рр. 2351-2355. Ramos, A.J., Sanchis, V., Marin, S., 2011. The prehistory of mycotoxins: related cases from ancient times to the discovery of aflatoxins. World Mycotoxin Journal. — V. 4. — pp. 101-112. Smirnov V.V., Zaychenko F.M., Rubezhnyak I.G. Mycotoxins: Fundamental and applied aspects. // Modern problems of toxicology - 2000. – V. 1. -pp. 5-12. Smirnova I.R., Mihalev A.V., Satyukova L.P., Borisova V.S. The current state of feed quality and safety in Russia // Veterinary Medicine. 2009. – V. 2. - pp. 3-7. Tutel’jan V.A., Kravchenko L.V. Mycotoxins (medical and biological aspects). - Moscow: Medicine, 1985. – 320 p.
Zlotnikov A.K. Biostimulant Albit for increasing the yield and crop protection / Ed. prof. E.A. Melkumova // Podolsk, National Research Institute of Plant Protection. - 2006. – 327 p.